Bonding and veneers are two great ways you can cosmetically enhance the appearance of your teeth – changing size, shape and color. When a dentist uses bonding, it means that he is applying a resin to your tooth to cover up an imperfection. A veneer is a piece of porcelain that covers the entire front of your tooth. They are both important options in your dentist’s cosmetic toolbox. Which one is best for you depends on your dental concerns and your goals. A veneer is a thin layer of porcelain that fits over the whole tooth. It can help with broken or discolored teeth and can change the shape of teeth that are irregular or too small. Porcelain veneers create a natural look and are as strong as natural tooth enamel. Because veneers require your dentist to change the shape of your permanent teeth before applying, they are considered a non-removable treatment. Your dental veneers are custom-designed to fit your teeth by a lab after an evaluation by your dentist. After removing a small amount of your natural enamel, your dentist applies thin layers of ceramic material to create a natural looking veneer. To create a strong bond between the natural tooth and the veneer, your dentist attaches the veneer with an adhesive, which is fixed to the tooth by a special “curing” light. According to the American Academy of Cosmetic Dentistry, veneers can be a good option in the case of discoloration, irregularly shaped teeth, chipped teeth and gaps between teeth. Dentists often recommend them when multiple teeth are affected. Dental veneers are custom-designed for your teeth and give a natural look. The porcelain used in dental veneers is highly stain resistant, allowing your teeth to stay white for years. Dental veneers are sturdy and durable and designed to withstand most of the regular use of natural teeth. They usually last up to 15 years. Because the natural tooth must be changed to accommodate veneers, they are considered non-reversible so may not be the best option for patients looking to preserve natural teeth. Veneers are strong but can be damaged by some activities. According to the AACD, patients with veneers may need a nightguard if grinding or clenching is a problem. Because porcelain veneers are customized and durable, they tend to be more expensive than other treatments like bonding. Bonding involves applying a composite resin (usually to fix part of a tooth) using an adhesive and high-intensity light. Your dentist will condition the underlying tooth and then add a soft resin, shaping it to match the rest of your tooth, then harden it with a special light. The bonding procedure is done entirely in your dentist’s office and often takes less than an hour. Who Can Benefit From Dental Bonding? Most dentists recommend bonding for small changes that don’t require covering the entire tooth. According to the AACD, bonding is most useful for repairing chipped teeth. Other uses include changing the shape of irregular teeth, covering discolored teeth and protecting the tooth root in the case of receding gums. What Are The Pros And Cons Of Dental Bonding? Bonding is simpler than many other procedures and doesn’t involve waiting for an outside lab. It involves little or no change to the original tooth, allowing patients to keep underlying teeth intact. Bonding is less expensive than many other cosmetic procedures and is accessible to more patients. The composite resin used in bonding does not last as long as porcelain and will need to be replaced more frequently. The bonding material is not as stain-resistant as porcelain and more susceptible to chipping. Your dentist’s mission is to help you get the smile you want in a way that fits your needs and budget. 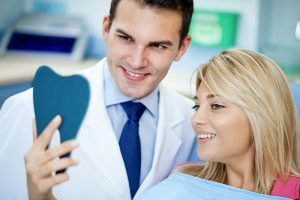 The best place to start when deciding on a cosmetic procedure like bonding or veneers is to have a conversation with your dentist. A general rule of thumb is that bonding is often the best solution for small changes in an overall healthy mouth. For patients who need bigger corrections and who are ready to invest in significant changes to their smile, a veneer may be the way to go. Your dentist is genuinely interested in the approach that’s best for you and will help you make the call with the most up to date information. © Copyright 2017 Hall & Butterfield Family Dentistry. All Rights Reserved.